This is the original Dagmar (German for day maiden). She is a Doubledoodle out of Dee sired by Max. Max is (retired Stud) a F1 Goldendoodle He is such a great dog. He is my first Doodle and I am sold on the breed. Max is so empathetic and affectionate. He is very loyal and can be quite protective. Max is on-site. 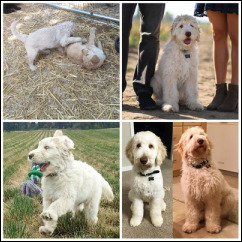 The above pictures are some of Max and Mocha's multi-gen Goldendoodle puppies born in Spring of 2015. 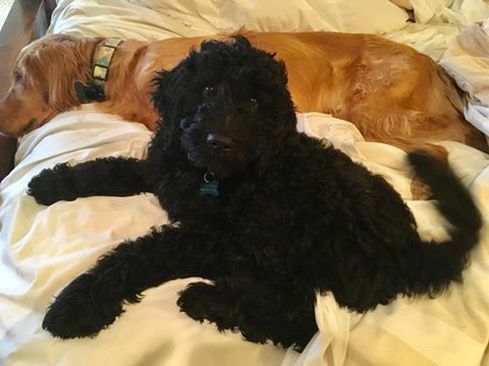 This black Goldendoodle is Franklin and is pictured here with his buddy Phineas. He is a littermate to our Charlie, and a carbon copy of my Max. Laurelwood Doodles is now located in Hawaiian Paradise Park in Kea'au on the Big Island of Hawaii. 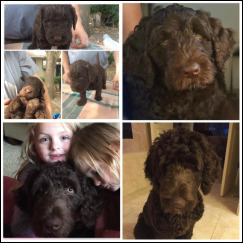 ​We provide Goldendoodles (cross between a Poodle and Golden retriever) and Doubledoodles (cross between a Goldendoodle and Labradoodle). Doubledoodles, also known as North American Retrievers, are considered Poodle Smart, Lab loyal and Golden Retriever friendly. All three breeds are in the top ten for intelligence. All of the puppies from this current litter have been spoken for. Stay tuned for information on the next available litter. Also, follow us on Facebook, we post a lot when we have active litters. You can see a lot of what of we do there; as well as the care and initial training we provide. Our efforts in providing outstanding pups is a lot of work. We are raising the bar on nurturing; and are constantly looking for ways to improve our process and the delivery of puppy care. Doodles are wonderful dogs. They are very loving and empathetic, and several of our puppies are either therapy or service dogs. Including a dog in one's life is a huge commitment, one that should last the lifetime of the dog. Dogs are sentient beings and as such should be treated with love and respect. They need people. Dogs are social animals and require attention. Please consider carefully your decision to have a dog. It takes 2 years for a puppy to grow into a mature dog. Puppy hood can be exasperating. Positive correction and guidance takes time and effort. The more time and positive effort you put into your dog will build on our efforts in producing quality canine companion. 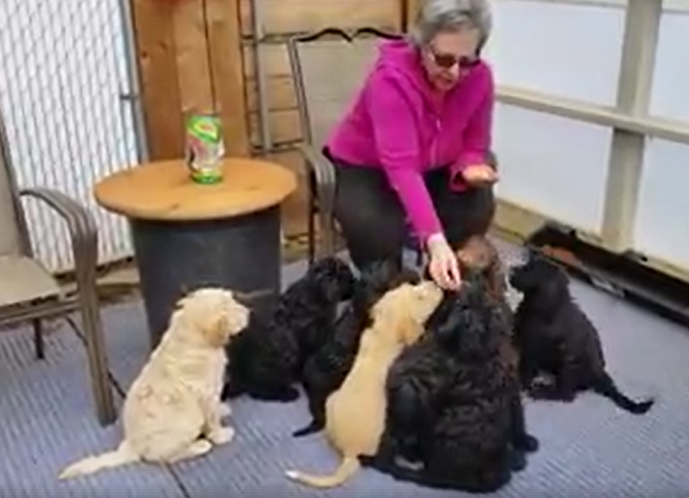 If you have a home with a fenced in yard; or someone to take care of the dog while your away at work; or perhaps you work from home; or are an active retiree; or a stay at home parent; or something similar, then we have some puppies for you to choose from. ​If you are planning on putting your dog in a cage (crate) while you're at work please don't buy from us. There is a reason why Zoo's stop putting their animals in cages. It’s bad for their physical and mental health. As part of our early development program desensitizing puppies to various aspects of grooming is part of our program. Here we are clipping puppy nails. Ginger with her favorite toy. Ginger is a F1 Goldendoodle. She is a energetic pup that loves to fetch. Ginger is very loving, and is a new addition to the family. 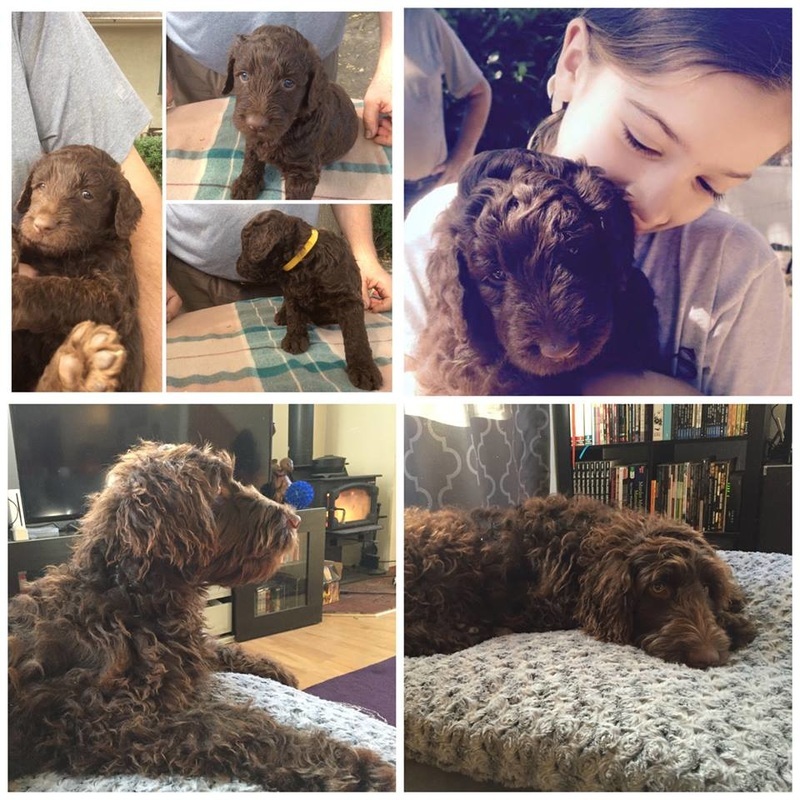 Charlie is our current Goldendoodle Stud (F2B). He is a lover and would be happy to cuddle all day. Charlie is one of our own puppies, and was six years in the making. Willow is a Doubledoodle also known as a North American Retriever (Poodle smart, Lab loyal and Golden Retriever Friendly). She is an F2B, and one of our own puppies. She is a very loving dog and like her mother, likes to keep the pack in line. Willow was six years in the making. 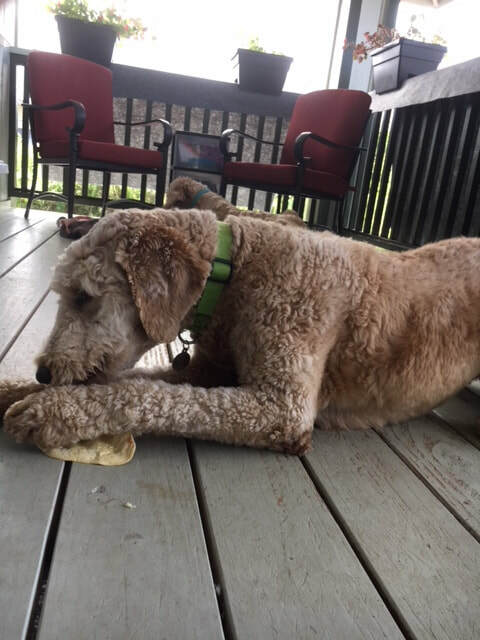 ​Claire is a littermate to Ginger and is an F1 Goldendoodle. She is very loving and had a laid back demeanor. Louie is an AKC registered Poodle and a visiting stud. He has a wonderful temperament, much like my Max. Claire and Louie had a litter of F1B puppies in October 2018. Arrow is a Doubledoodle. He is an F2B. Super sweet.